Are you looking for a way to promote your business or services to the BMX community? Do you have a racing family or team you want to make stand out from the others? 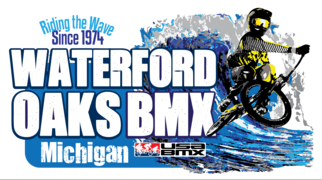 Then Oakland County Parks has a way you can become a sponsor of one of the oldest BMX tracks in the World Waterford Oaks BMX Race Track. 3’ X 5’ banner (printed by fast Signs) that will hang along our fence line during races including state series races and special events along with some open ride sessions. Name announced at every Saturday race. Waterford Oaks social media posts with your name / links to your social media. Call the track director at (248)858-0915 to learn more today.